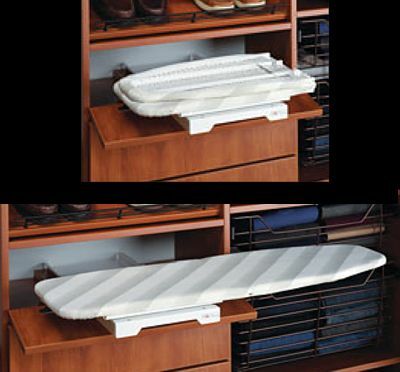 PRESORT: Cut down on laundry time with an organized method for presorting clothes. 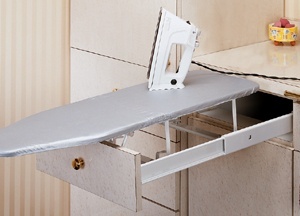 IRONING: Even with "wrinkle resistant" and "permanent press" clothes, there is always the need for ironing! Sometimes it's just touching up a shirt that got squashed under other clean laundry, or maybe it's full blown ironing of crinkled summer cottons. Whatever your need, there are board styles (and cabinets to hide them in) for everyone. 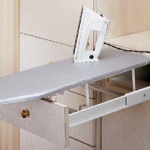 Are you passionate about ironing and need a full-size board? 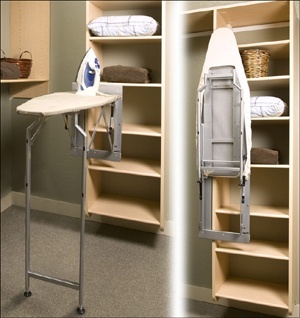 There are models that mount to a side wall, swivel, and pull down when needed. 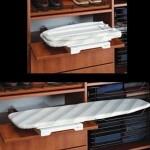 Others hide discreetly within slim cabinet doors. For folks who only need a quick touch-up now and then, there are two different models that easily stash away in a drawer! LOST ITEMS: More than just socks go missing in the laundry room! 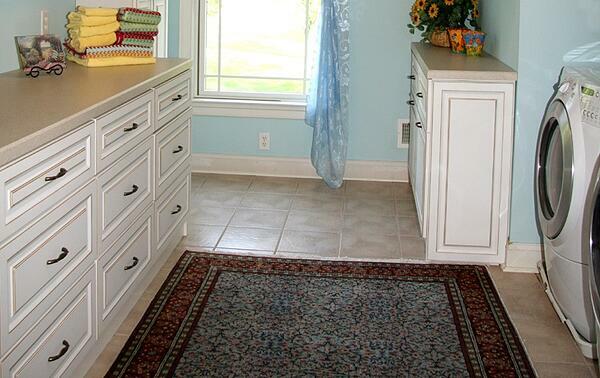 Add a pretty container or basket near the washer to collect items found in pockets. Keep another basket handy to collect lost and lonely socks. Then once a week, sift through the socks and reunite the pairs. 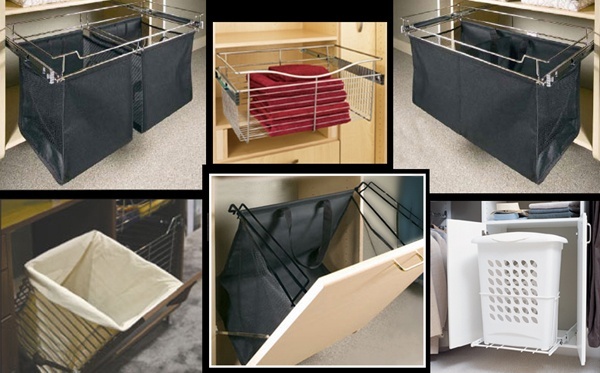 By deciding where things go (at least temporarily) and remembering to make the system logical and accessible for everyone, you'll have more success with laundry organization in the long run. 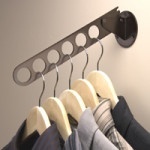 DRIP DRY: Allowing permanent-press items to hang over a sink or basin is a cinch with the installation of a simple closet rod. Go one step further, and install a pull-down rod. This handy rod allows clothing to hang up higher and out of your way, yet can easily be pulled down and locked in place for adding and removing items. DRY CLEANING: Although you won't be running dry-clean clothing through your own washer and dryer, sometimes these items end up in the laundry room by mistake. 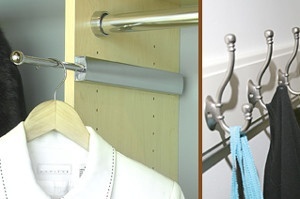 Having a valet rod handy (or even a simple set of hooks) allows you to hang and easily collect them for your next run downtown. Now, just because you have all the latest gadgets, that doesn't mean you don't have to commit to a regular laundry schedule. Remember, if kept in the laundry hamper too long, stains and wrinkles have a chance to settle into your clothes and make themselves permanent. A load of wet laundry, forgotten and left in the washing machine, invites mildew. The load of dress shirts in the dryer, forgotten and unfolded, will settle back into their rumpled states once the heat dies down. 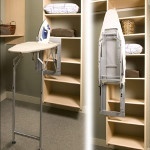 Stay "on top" of your laundry chores and truly enjoy the conveniences these gadgets provide! If you would like professional help planning your laundry room, please contact us for a free in-home consultation. (southeast PA, NJ, DE) And, if you are looking for cabinetry customized to suit your personal needs, you can reach us at 215-855-4400.